To create your Custom Katana, add it to the cart, select your customizations from the drop down menu, add any optional extras and we will take care of the rest! "The Budget Version of the Classic SBG Custom Katana!" A stripped down, munitions grade version of the SBG Custom Katana for the custom sword collector on a budget. 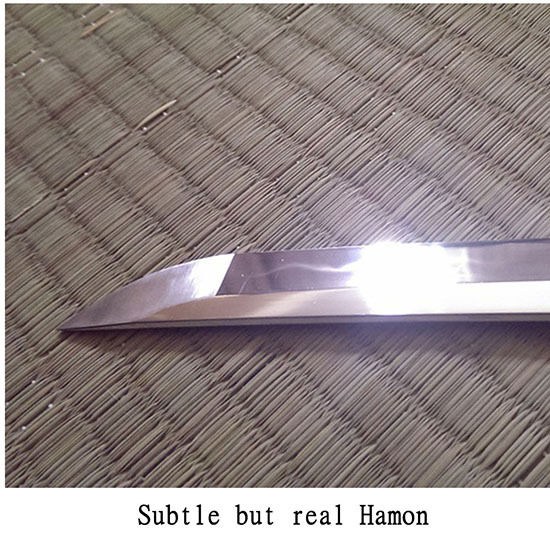 The blade is 1050 carbon steel and has been differentially hardened in the traditional way to produce a subtle hamon. The hybrid polish is basic but with extra work makes a great project piece. The premise behind the custom katana project is simple - we make several large batches of katana with the Black Dragon forge throughout the year and you get a chance to include your own order for a unique combination of components and blade types (your custom katana) along with all the others - essentially a quality guaranteed group buy under the protection of the SBG umbrella. With the SBG Custom Katana Lite, the basic blade your design will be built upon is a 28" differentially hardened and traditionally clayed 1050 carbon steel blade (as the steel is easy to work with, yet when properly heat treated results in a very servicable blade). Then, just like with the standard version, you choose whether or not you want it fullered, choose the fittings (either brass, or a selection of the sturdiest alloy, tsuba designs) and a matching fuchigashira that you like, select the color and texture of the ito, choose black or white same (rayskin) and the finish it up with your saya of choice to create your own unique personalized design! - all for one flat rate..! But it gets even better, because rather than shipping direct from the forge and hoping for the best - we send each sword to a warehouse in the USA where it is pre-inspected for quality and then shipped out to you ANYWHERE in the world, with the whole process from your order to final shipping usually taking approx. 90 days (sometimes slightly more, sometimes slightly less, but 90 days is the working average - though we keep you in the loop as much as possible). To get started, simply have a look through the various component choices at the top of the page, add the custom katana to the cart and from inside a drop down menu that appears select the customizations you would like, hit the order button and one of the SBG team will be in contact with you to confirm your choices. From a few days to a couple of weeks later (once all the orders are "batched up" behind the scenes), we'll fire up the forge and begin work on your own unique, one of a kind custom made Katana! PLEASE NOTE: While we will do our very best to create your sword as close as humanly possible to that you design you come up with, please note that because we are using stock photos of the components and that computer monitor colors are different depending on the settings, some MINOR variations between the colors and designs seen above and the final product are to be expected. * Blades are available with a fuller/bo-hi for a faster, lighter blade (emphasis on speed) or solid bodied for a more durable, forceful cutter (emphasis on cutting power) as per your preference. Hand forged 1050 carbon steel with very subtle but real hamon tempering line. Properly sharpened and suitable for light, traditional cutting practices. * Tsuba's on the Custom Katana Lite are available in either brass or alloy. The alloy designs available have been carefully screened and selected for their durability. Then also pick a Fuchigashira (tsuka reinforcing collar and end cap) set to your taste from 12 available options. * The rayskin is real and available in either white (natural) or black. 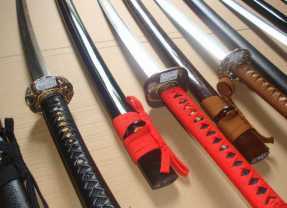 All swords are double pegged with bamboo mekugi. Tsuka is 11” long (minor variations of 0.3” either direction, optimized by the forge). * The saya are wooden and available in a wide range of glossy and sparkling lacquer options as well as a textured black. * Version 3.0 of the SBG Custom Katana comes with a premium kissaski with real geometric yokote ridge line, boshi and the same level of reflective polish as the blade itself. The Lite version does not include this refinement to keep costs down (finishing the polish of a kissaki is very time consuming and expensive). Step 1: The first step is of course to design your sword and place your order, reserving your spot in the current batch. Because we need to pay the forge in advance, you also need to pre-pay in full (as we operate on low margins, we are unable to finance your custom sword for you) and once work has begun at the forge we cannot accept cancellations except in extreme circumstances. We need you to commit to us and in return we commit to deliver you your product as ordered, made to the highest possible standard. For the sake of example, let’s say you want to make a sword you will call the ‘Crimson Dragon Lite’. So you select the solid bodied option (as you want a fast but forceful cutting sword), pick the P2 "Brass Dragon" tsuba and matching C10 set (called the "Black Dragon" because this is the same classic set used on the SBG Black Dragon Katana). Then you select black cotton ito with standard white rayskin and finish it all off with a crimson saya. Satisfied with the design, you submit your order to the batch. Please provide a daytime contact telephone number when you order in case we need to check something with you and also to provide to the courier in case there is any trouble at the time of delivery. Step 2: We will check your order and send you an email within 1-2 business days confirming your customizations along with a rough computer generated mock up image of what your color combinations will look like. So in the case of our Crimson Dragon Lite example above, we’d send you a picture that looks like this. This picture is more a general ‘color scheme’ check for you (it doesn’t take into account details like the bo-hi or any optional upgrade options you may purchase). But it at least gives you a rough idea of how the various components will ‘gel’ and come together. Step 3: While we are batching up all the orders together and making the necessary arrangements with the forge - a process that usually takes around 2-3 weeks, you can make a few changes or tweaks if you like. Just email me and it will be modified accordingly (once we submit to the forge though, that’s it –your order is locked in for the duration – so if you do want to make a change, this is the only chance). Step 4: After around 2-3 weeks once we opened on new orders, we batch them all up, send all the payments through to the forge, and get them to work on all the designs. Step 5: The hardest part – waiting while the forge does their thing. 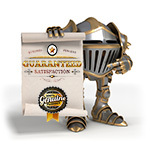 Wait time varies, but as we take quality very seriously, we won’t rush it. On occasion the process may be delayed due to seasonal holidays, customs or shipping issues but on average it usually takes around 3 months from placing your order until your custom sword arrives (some swords will come in earlier than others – luck of the draw I am afraid). I’ll update you by email at least a couple of times while the sword is in production to try and make it bearable, but you can always email at ANY time for an update if you are getting antsy. But please, try to be patient. Until recent times, any kind of customized sword would take YEARS to produce and arrive – we have shaved all that down to a few months and at a fraction of the price it would normally cost, so while I’ll do my best to try and make it bearable, please do your best to be patient. It will be worth it in the end.. Step 6: Once all the swords are ready, they are sent in boxes of 10 via airfreight to my agent in the USA who will quality check them, ensure no errors have been made and then repackage your sword and sent it out to you along with the relevant tracking information and then all you need to do is enjoy your new custom designed blade! (Note: if during the wait time you change address please let us know in advance as soon as you can so we can ensure your sword is sent to your new address accordingly). Unlike ordering direct from ebay or from a forge in China, if there is something wrong when you receive your order (and we go the extra mile to make sure this is RARE) – we’ll work with you to ensure a happy outcome. The forge knows that SBG batch orders are special, and THEY want OUR repeat business, so they do put more effort into our batch than they would if you were to order a single sword by yourself. But at the end of the day: if you aren’t happy when it comes in, we will do what it takes to make it right for you, be it for a SBG Custom Katana 3.0 or the LITE, our guarantee stands in all cases. Have fun with process - and if there are any questions feel free to drop me a line! For people want something just a little bit more special, you can select to have your sword FOLDED for a mere additional US$60. Blade: Sharpened Differentially Hardened 1050 Carbon Steel Blade with natural hamon. Blade Length: 28” (measured from back notch of habaki – if measuring from tsuba for comparison to other swords, add 1”). Weight: From 2lbs to 2lbs 3oz depending on if a bo-hi is selected or not (bo-hi is lighter) and style of fittings selected. Tsuka: standard 11” (give or take .3” of an inch in either direction – optimized by forge). Real rayskin panel wrap. Available in 11 colors with cotton or synthetic silk (rayon) tightly alternating ito wrap. Fittings: Select either Brass or Alloy Tsuba and a suitably matching Fuchi Kashira set (Alloy). Saya: Matches blade length, available in 12 lacquered colors including high gloss, sparkling and textured black. Sageo cord will match the ito wrap selected (default black for leather wrap upgrade option). *Please note: As the swords are hand made some small variations are to be expected. Designed for light to medium cutting practice in the dojo or the backyard or for display purposes. Sharpened Differentially Hardened 1045 carbon steel blade with real hamon. Basic zinc alloy fittings. Cotton or Synthetic Silk ito in 11 colors. Average lead time 90 days after each monthly batch closes. FREE SHIPPING to the USA and Canada from our Canadian warehouse based in Manitoba, Canada. You can check on the current status of the batch anytime by clicking here or just contact us with your order number and the batch details to request an update and we will get back to you asap. Tracking information is emailed automatically after final inspection and shipping.